These designs come purely from my heart and from my favorite time in history, the late Victorian and Edwardian era — the age of Art Nouveau design. 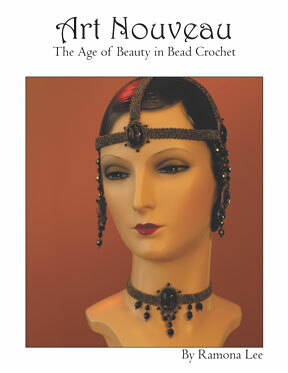 My new book features bead crochet projects that have the look of beadwork without beading. 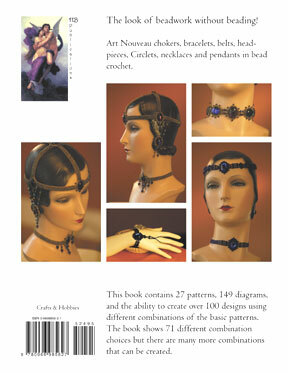 Chokers, bracelets, belts, headpieces, Circlets, necklaces and pendants all done in Bead Crochet. This is an 8.5" by 11" book with 99 pages, 27 patterns, 149 diagrams, and instructions to create over 100 designs using different combinations of the 27 basic patterns. There are 71 different combinations illustrated in the book, but many more can be created. You are limited only by your imagination! Book will be shipping in mid October and retails for $24.95. art nouveau (är' nûvõ') , decorative-art movement centered in Western Europe. It began in the 1880s as a reaction against the historical emphasis of mid-19th-century art, but did not survive World War I. Art nouveau originated in London and was variously called Jugendstil in Germany, Sezessionstil in Austria, and Modernismo in Spain. In general, it was most successfully practiced in the decorative arts: furniture, jewelry, and book design and illustration. The style was richly ornamental and asymmetrical, characterized by a whiplash linearity reminiscent of twining plant tendrils. Its exponents chose themes fraught with symbolism. They imbued their designs with dreamlike and exotic forms. The outstanding designers of art nouveau in England include the graphic artist Alphonse Mucha, A. H. Mackmurdo, Charles Ricketts, Walter Crane, and the Scottish architect Charles R. Mackintosh; in Belgium the architects Henry Van de Velde and Victor Horta; in France the architect and designer of the Paris métro entrances, Hector Guimard, and the jewelry designer René Lalique; in Austria the painter Gustav Klimt; in Spain the architect Antonio Gaudí; in Germany the illustrator Otto Eckmann and the architect Peter Behrens; in Italy the originator of the ornamental Floreale style, Giuseppe Sommaruga; and in the United States Louis Sullivan, whose architecture was dressed with art nouveau detail, and the designer of elegant glassware Louis C. Tiffany. The aesthetics of the movement were disseminated through various illustrated periodicals including The Century Guild Hobby Horse (1894), The Dial (1889), The Studio (begun, 1893), The Yellow Book (1894-95), and The Savoy (1896-98). The works of Beardsley and Tiffany were especially popular. A high point in the evolution of Art Nouveau was the Universal Exposition of 1900 in Paris, in which the "modern style" triumphed in every medium. The jewellers were keen to establish the new style in a noble tradition, and for this they looked back to the Renaissance, with its jewels of sculpted and enamelled gold, and its acceptance of jewellers as artists rather than craftsmen. In most of the enamelled work of the period precious stones receded. Diamonds were usually given subsidiary roles, used alongside less familiar materials such as moulded glass, horn and ivory.